Cowper Memorial United Reformed Church was named after one of the deacons read a brief history of the church from 1662. He said "It is 79 years since Cowper had left this mundane world to grace the higher and the eternal, to take the golden harp that is strung and tuned for endless years. Surely it is time that something was erected to his memory, something that was worthy of the man, worthy of the town, worthy of the nation and what better than a place of worship! What better than a Congregational Church." A special family service is held every three months when talented church members, both young and old, entertain the congregation. Others are given the opportunity to read their favourite passage from the bible and choose their favourite hymn. The Church leader is Brenda Hustwait. The Sunday service of worship is conducted in the church at 10.45 am. Children's Sunday school is held during the service following the children's hymn. Holy Communion is taken on the first Sunday of every month. 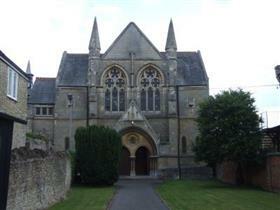 The Sunday service of worship is conducted in the church at 10.45 am. Children's Sunday school is held during the service following the children's hymn. Holy Communion is taken on the first Sunday of every month.